Great Northern Beans slow-cook with bacon and molasses in this thick, rich, authentic Boston Baked Beans recipe. When I first published my Southern Style Baked Beans I got an email from a reader that read, “SO DISAPPOINTING! I thought this would be a REAL recipe for baked beans! GARRRGGH! !” Or something like that. And even though I have received hundreds of compliments on the same recipe, that one email has always stuck with me. I guess his point was that I use canned pork n’ beans in that recipe instead of making the beans from scratch. Usually I just channel my inner Elsa and “conceal, don’t feel” when I get nasty email but I don’t like anyone thinking I can’t cook something. Just because I don’t start from scratch on that recipe doesn’t mean I can’t. So, guess what I did this weekend? I made real deal, from scratch, homemade Boston baked beans! And, boy oh boy, was it an experience! Those suckers required some lovin’ over many, many hours but in the end it was worth it! And really, I love having recipes like this to make on those days when it’s cold and wet outside and I’ve got 900 loads of laundry to do. Something that needs tending to is the best kind of recipe to make when you’re keeping time at home! 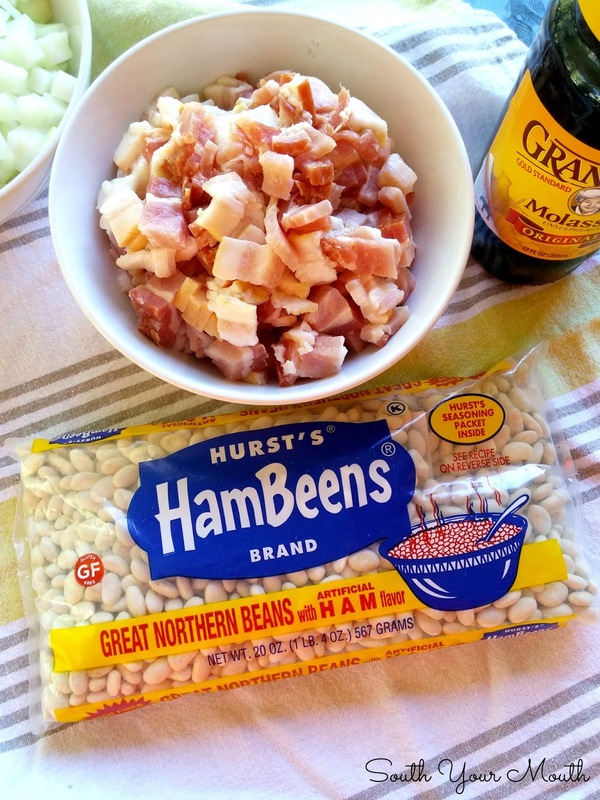 If you can’t find Hurst’s Great Northern Beans in your local grocery store, ask for them! My grocery store now carries all sorts of products they didn’t have before simply because I asked for them. Just ask the cashier who to talk to to request a product and s/he will point you in the right direction. My store has a list at the Customer Service desk where they notate products their customers' request. Combine dried beans (with seasoning packet) and water in a large pot and stir. Bring to a slow boil over medium heat (not high - we want these to cook gently) then reduce heat to low, cover and simmer for 2 hours. Drain beans, RESERVING LIQUID. Pour liquid into a 2-cup measuring pitcher. You should have right at 2 cups of liquid. If not, add water to make 2 cups. If you have more than 2 cups, just discard the extra. Combine 2 cups bean liquid, molasses and remaining ingredients then stir well. Set aside. 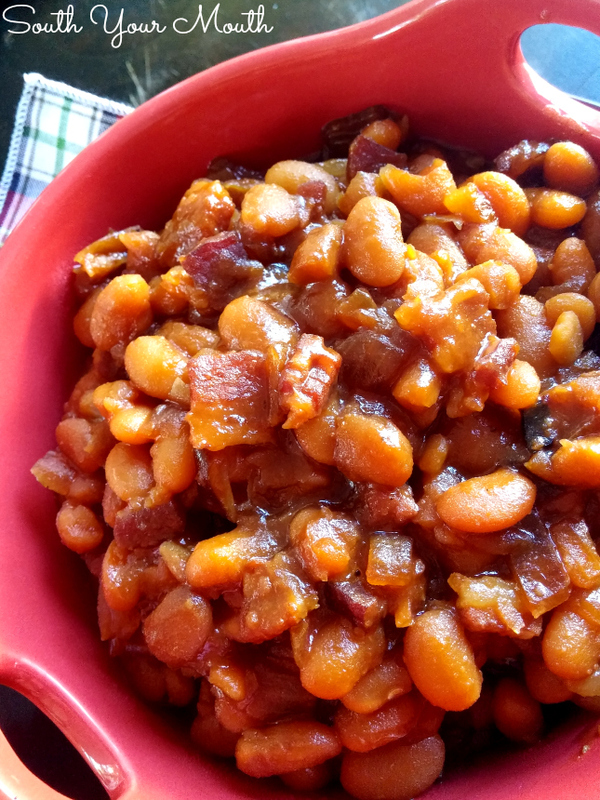 Using a 2-quart crock, bean pot or baking dish (a deep, bowl-shaped vessel is best), layer onion, bacon and drained beans. Pour liquid mixture evenly over beans. Like this!! Cover with a tight-fitting lid or aluminum foil and bake at 325 degrees for 2 hours. Uncover beans, stir, then continue baking, uncovered for 3 hours, stirring occasionally to ensure the top doesn’t brown too much or dry out. Yes, this seems like a ridiculously long time to bake the beans but it takes this long for the beans to get tender and for that liquid to turn into Boston-baked magic. Remove beans from oven, cover and let sit until sauce thickens (if it’s not thickened already). Authentic Boston Baked Beans don’t have ketchup in them but I wanted a touch of acid in here to balance the creamy beans and sweet molasses. If it goes against your religion to put ketchup in Boston Baked Beans, substitute with additional molasses. You don’t want to make this in a shallow dish as the sauce will evaporate rather than cook into the beans. If you don’t have any other choice, cook the beans covered for 3 hours (vs 2) then cook uncovered for 2 hours (vs 3). I really don't know if these will work in a crock pot since they need to cook uncovered (I think the sauce will stay thin in a slow cooker). If you try it and are successful, comment below to let us know! If you can’t find Hurst’s Great Northern Beans in your market, please ask your grocer for them. Until then, you can order them online! Ha, ha! I thought this was so funny! I know exactly how you feel, I am very picky about the food I cook and I want everyone to like it as much as I do. I am 64 years old, Mandy, and I have never made baked beans with dried beans! Too much work! But I may have to try it now just because they look so good on your site. I make mine just like your recipe but I use pork and beans too. They are always good as I am sure yours are, too! Jojo, I don't know how I missed your comment back then but THANK YOU for it! PS) You are so appreciated, thank you for this recipe! Bring beans to a boil for about 5-10 minutes in large pot with plenty of water. Then simmer on low until softish, about 40 minutes. Drain. Put all ingredients in slow cooker. Add 1 cup water and stir to blend. Cook on low 10-12 hours or Hi 6-8 hours. Stir occasionally. One hour before finished, check to see if beans are too liquidy. If so, leave cover off till liquid is concentrated to your liking. This is my first time writing up a recipe. Hope it's OK. 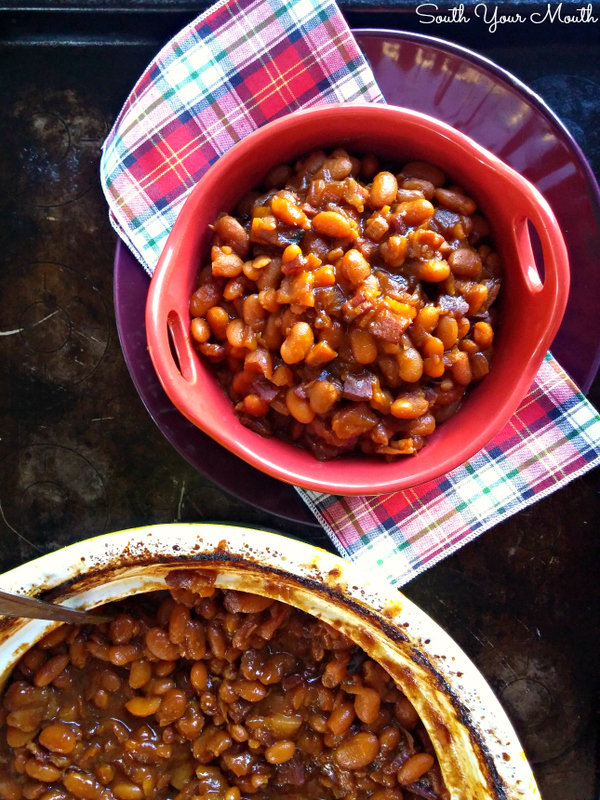 These beans are a crowd pleaser and I usually make double the recipe. Enjoy!!!! How long should I cook in the crockpot? And what temp? I've been looking for a recipe like this. My grandmother made these & I remembered them as tasting yummy. I'm a ketchup fiend, but have been looking for a baked beans recipe without. I called them Mustard Beans and never could find a recipe. My mom didn't like them, so she never picked up Grandma's recipe for them. Looking forward to trying these. Thanks.